Charlize Theron. Charlize Theron Charlize Theron Charlize Theron Charlize Theron Charlize Theron Charlize Theron Charlize Theron Charlize Theron Charlize Theron Charlize Theron Charlize Theron Charlize Theron Charlize Theron Charlize Theron Charlize Theron Charlize Theron Charlize Theron Charlize Theron Charlize Theron Charlize Theron Charlize Theron Charlize Theron Charlize Theron Charlize Theron Charlize Theron Charlize Theron Charlize Theron. She is why I watched this movie, so I might as well just get that out of my system. Actually, I also watched this movie in hopes of seeing Chris Hemsworth shirtless. Disappointment. But otherwise, I wasn’t disappointed at all. In fact, having placed so little concern over the other aspects of the movie, I was pleasantly surprised – particularly with Kristen Stewart. Going up against Charlize Theron, I had assumed, having not seen Stewart in anything else (yeah Twilight ain’t ever going to happen), that Theron would eat her alive, but Stewart managed to not only hold her own, but actually impress me enough to give her a whole paragraph in this review. She even managed to express emotion, in spite of those dead, dead eyes. Storywise, it worked well enough, though it seemed to bounce quickly through its necessary plot points, with a few slightly unexpected twists. I appreciated the minor visual homages to the Disney version. Speaking of visual, I loved that aspect of the film. And I don’t just mean looked at Theron, though that was lovely, especially with her costumes. Kudos to the designers for all of those and I loved that that imagery extended into the closing credits (which reminds me, I need to hunt down that song). 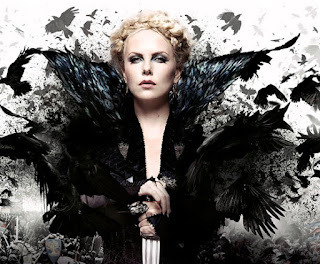 There was, perhaps, not enough time spent with the Queen, as this was supposed to be as much her story as Snow White’s, but the basics of Ravenna’s pain were handled in a pithy manner that Theron pulled off as best she could with the limited screen time. At least I have Regina in order to enjoy a kinder, gentler Evil Queen. I will not hold out hopes for a Ravenna/Maleficent crossover. Finally, the dwarves. They were okay, though I don’t think we saw enough of them and I spent far too much time trying to figure out how they work – and if real Little People took offense to having such roles portrayed by others with the help of fancy camera work and CGI. Some quick research reveals that yes, this is the case. As much as I like Ian McShane, we know there is a large pool of actors available to play such roles. But Hollywood is always willing to put aside logic to go with ignorance. With The Hobbit on the way, this problem clearly isn’t going away.